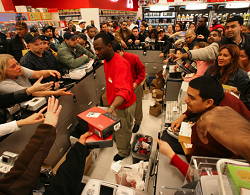 Does the Consumer Matter to the Stock Market? Or not, it probably doesn't matter to the overall market. It seems that many bullish cases rely on a "strong consumer" to create a healthy market. We'll then hear that 70% of GDP is driven by the consumer, while neglecting the fact that healthcare costs, government or otherwise, are included into that equation. Why is this important here? Oil. Everytime we see the "risk off" trade come through in full force, pundits will bring out the fact that oil being lower makes it not so bad, because it's money in consumer's pockets. 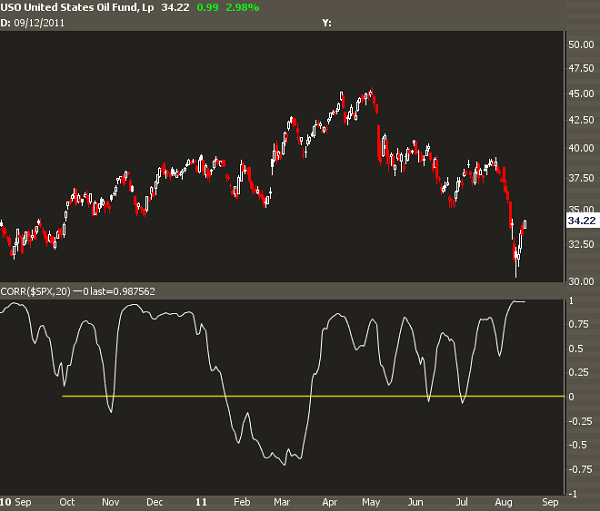 This is a chart of $USO along with its rolling 1-month correlation with the $SPY. This relationship has tended towards a positive correlation for the better part of the past 12 months, and with the current "risk conveyor belt" we find ourselves on, it's pretty close to a 1:1 relationship. Remember, the market tells us a story. And the current narrative being put forth is that oil higher may be bad for consumers but for now they don't matter. Oil is currently a perceived proxy for global growth and energy demand, and if those two causes drop off, so will oil, and that's not good for equities.